Before we get into this week's Waiting for, I wanted to mention that I did, in fact, pick up the Batman: Arkham Asylum video game yesterday. What's more, I even managed to take the game out of its cellophane wrapping. I haven't played it yet, but that's mostly because I fell asleep at an embarrassingly early hour last night. I also wanted to mention how not-so-easy it was to actually purchase the game. Just as I was about to leave the office and head over to the local Gamestop, I got an email from a buddy saying that they were sold out. It was only about 1:00 at that point, so I was pretty surprised. Like an idiot, I didn't pre-order the game, so my glass half broken mentality set in, and I started to resign myself to the fact that I wasn't going to get my hands on the game anytime soon. So I decided to work through my lunch hour (as usual) and maybe head to the mall at the end of the day. Then I thought, wait, there are a bunch of stores in malls. One of them must still have some copies left. A lightning bolt to the head, that. I called the FYE, and was assured that, yes, they had plenty of copies left. I asked if I could have one held for me, and I was told that, while it's not neccessary, it would be okay. He took my name, and that was that. Okay, fine. That didn't happen. Anyway, holding is not really the word to be used in this case. You see, even though it was almost 3:00, they still hadn't even opened their Tuesday shipment of DVDs, CDs, and video games yet. So the guy at the register said he'd need my name and number to hold a copy. My response was, "Um, but it's in the store." And with that, let's get to the comics. This week is HUGE in terms of floppies shipping today, so that $63.77 is going to haunt me a bit as I head to the LCS this afternoon. Seriously. Tons of books. And good ones, at that. There are some major releases from DC and Marvel, including the first issue of the latest Kevin Smith-penned Batman mini-series, Batman: Widening Gyre, as well as a metric ton of Dark Reign tie-ins from Marvel. There's also a tiny little book that will finally ship its last issue, almost a year after the previous issue came out. But I'll go into that in more depth a bit later on. First, a quick rundown of the Big Two. As I said, DC hits the shelves hard today with issue one of Kevin Smith's latest foray into the world of the Dark Knight in Widening Gyre. Now, Smith recently wrapped a three issue Batman story called Cacophony, which was met with some mixed reviews, but sold very well. I read it, and liked it, but then again I'm a Smith die-hard so my judgment may be clouded. One of the things that people seemed to hone in on with Cacophony was an offensive scene involving the Joker in issue one. It was a pretty unnecessary addition, in my opinion, but whatever. It's Kevin Smith, and there's going to be stuff like that in the things he writes. DC knew what they were getting, and readers should have, as well. That scene aside, though, issue three of that series includes one of the best Batman/Joker conversations I've ever read in comics. Really. It was that good, and it makes the mini-series a must-read. Anywho, on to Gyre. Smith friend Walt Flanagan will be doing the art for this series, and there will be (stunning) Bill Sienkiewicz covers throughout. Flanagan did the art for the previous Smith series, and while it wasn't mind-blowing by any stretch, it was certainly solid. Once again, Kevin Smith--the fan-favorite creator behind GREEN ARROW and Daredevil-- teams up with Walter Flanagan--the artist on the acclaimed series BATMAN: CACOPHONY--for an all-new adventure starring The Caped Crusader. The stakes are high as Batman encounters a new vigilante under his wing amidst what Smith describes as a "backdrop of romance, intrigue, and geek-bait guest stars galore." Trust us when we say that it's as awesome as it sounds. 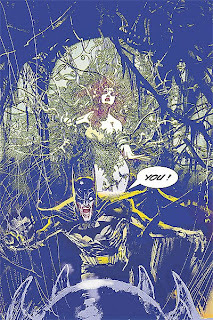 BATMAN: WIDENING GYRE is just the start of things for Kevin in the Bat-Universe so get on board now! This issue will be 48 pages, and it carries a $3.99 price tag. DC has announced that Smith will be introducing a brand new villain, and that he'll be writing much more Batman in the near future, so if you're a a fan of his, I'd suggest getting in on the ground floor of things. Across the street, Marvel has a comical number of Dark Reign tie-ins out today, so if you're following that story, you get to choose from a handful of books. But, for my money, the Brian Reed-penned Ms. Marvel series is one of the shining examples of a great storyline within a large event. Dubbed "The War of the Marvels," this arc deals with Carol Danvers' (Ms. Marvel) "death" and resurrection. The only problem is, someone else has taken up the mantle of Ms. Marvel in her absence. And, instead of keeping the real Ms. Marvel in a cave in Grant Morrison's head (oooh, DC you got burned! ), Reed brings Carol back within two issues of her demise. Today's issue, number 44, continues the tale, and the two Ms. Marvels fight. And the Avengers (both New and Dark, mind you) fight. Lots of fighting, lots of action. This is great summertime super hero fare, and I suggest you check it out. My only caveat would be that the art, while stunningly rendered by Sana Takeda, is a bit too cheesecake-y for my tastes. Still, this book has been great since its re-launch a few years back, and Brian Reed deserves a ton of credit for making this a must-read book in the Marvel Universe. And, finally, we get to the book that I am most excited about. As you know, I've lauded The Goon as being a "little indy that could." Well, if Goon is the little indy that could, then this next book is the littlest indy that could. 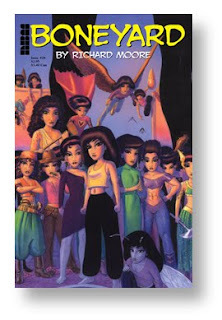 Richard Moore's Boneyard is a title I've talked about in the past on the blog, and it's a book that is near and dear, for several reasons. First, it's by an incredibly talented writer/artist who doesn't get nearly enough credit for the amazing work he does. Second, it manages to achieve the toughest thing to do in comics--it's laugh out loud funny, and Moore's comedic timing is dead on. And third, it's this tiny little black and white thing that ships...um...let's say sporadically...from a small press house, and yet it manages to keep a solid enough fan base that every arc had been collected in trade. Actually, last year NBM (the publisher) began collecting the series in color, as well as in black and white. Boneyard is a rare book in the comics landscape in that it has no trace of super heroes, it's still printed issue-by-issue in black and white, and it has remained at NBM for its entire run. Today's issue 28 is bittersweet for fans of the series. On the one hand, we finally (FINALLY!!) get to read the last installment of this series. But on the other hand, this is it. The last issue. No more Boneyard. And, while 28 issues might not seem to be a staggering amount of product, remember that Moore is the writer, artist, letterer, and editor of the title. I wish this series would receive more attention from the mainstream comics press, because it's one of those "bridge" books that has the ability to hook outsiders into the comics medium. But it won't receive the press that it deserves, mostly because the world would end if we didn't get another interview with a "hot" mainstream artist on the big news sites. Listen, you guys know me. There's nothing wrong with the mainstream comics industry. I love it to death, and I will continue reading the big, honking cross-overs, and I'll continue to go to conventions and shake hands with mainstream creators. But there's no reason (No. Reason.) why the smaller publishers shouldn't get the coverage they deserve online, or in the printed comics press. What's more impressive--completing a mini-series for Marvel or DC, with financial backing and a team of editors and coordinators, or making your own comic? Because I'll take the latter. Believe me. I know. So, anyway, while new readers really shouldn't jump on with this final issue of Boneyard, I would urge everyone to check out the trade collections (they are very cheap, and they're all on Amazon). That's my diatribe for today. Everyone enjoy New Comics Day, and before we go--what are you Waiting for? Flash: Rebirth 4 was very good. There were a lot of good full-page moments in that one. It's interesting to see the Speed Force "mystery" wrapped up nicely, sort of. It doesn't hurt that I've always liked the Flash, either. I've noticed a lot of previews for Superman: Secret Origin. It looks interesting, but honestly, how many different retellings do we need cluttering history? Well, Secret Origin will be written by Geoff Johns, and his stuff is always solid. I've actually been on a major Geoff Johns kick of late. I'm enjoying Flash: Rebirth, and I am LOVING Blackest Night, the Green Lantern event. I've never really cared for Green Lantern as a character, but Johns' writing is so accessible and flat out fun that I'm going back and reading his entire run in trades. Blackest Night is intriguing on the home front, less fun on the Lantern front for me. There are just too many rings.